Your attitude towards others will impact how they treat you. Your work ethic helps determine how far you’ll go. How much time you spend with your children affects the depth of your relationship with them. And how you view money will have massive implications on how much of it you accumulate. How we choose to use our money is equivalent to the farmer sowing his seeds. If the farmer wanted, to he could keep his seeds in the package or feed them to the birds. It’s his choice. I wouldn’t care and neither would you if he went either route. But what I don’t want to hear from the farmer is complaining that he doesn’t have a harvest to feed his family or to sell on the open market for a profit. 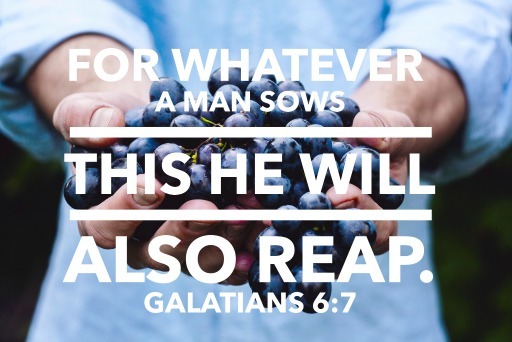 He chose to sow the seeds to the birds. What was he expecting would happen…that the birds would turn into turnips? The simple truth about money is this: Where you sow your dollars says a lot about what you value. What you value now helps predict your financial health down the road. If you only sow to the frivolous activities of the present, your future will undoubtedly be bleak. You’ll end up having nothing to reap later on because you failed to use money in ways that would produce future rewards. What I’m really talking about here is where we direct our hard earned dollars. Of course what each of us thinks is important varies. Regardless of that, it should be our priority to sow our money in directions that will reap us something of value. It should never be a surprise that you will reap what you sow – even with your money. Put it in the right places. Care for it. Nurture it. Keep adding more to it. Only then will you be able to reap what money was intended to provide – freedom and peace of mind. Questions: What are you hoping money provides for you? How are you “working the ground” so to speak with your money right now? Do you agree with this truth about money that you reap what you sow? Does where you sow (spend, use) your money says a lot about what you value? Why do you think people are surprised their life turns out a certain way when they have managed money so poorly? Great analogies in here Brian. We’re sowing for our freedom. Though that may sound like a selfish thing to some, my wife and I actually view it as the ultimate gift both to our children and ourselves because it means we’ll have more time to all focus on each other (rather than worrying about work). “…sowing for our freedom.” I don’t think it’s selfish at all MMD. Freedom doesn’t mean relaxing and never working. It just means getting to the point where you have better choices and can allocate your time to things you want to do that really matter (like focusing on one another). Brian recently posted…Is the Bible Really Clear About Paying Taxes? I sow to knowledge. I am now getting my master’s degree, though it costs lots of money. But, I know this will result in higher income and good job position in the future. Thanks Brian! Good article. “…sow to knowledge…” Can’t go wrong with that approach as long as you don’t go deeply in debt to get it. So true, Brian. It’s amazing how money people don’t grasp that simple concept. So many want the quick money or easy fix. Those rarely exist or last long. It is the work you do, along with understanding the choices you make with what you have, will give you the freedom to use your wealth on what matters most. Work + right choices = freedom. I like that formula Shannon! Stepping away from money, I knew a girl who blazed through friends because she was negative, mean to them, etc, but then was always sad when people seemed to not like her. Perfect example there and yes, you can apply that quote to everything in your life! Great post Brian. I think so many don’t know how to sow properly and are in need of help. I’m hoping my money provides me more opportunity to help others. I’m starting with my children first teaching them more than I was every taught and work with my local community as well. “…starting with my children first…” That’s the correct approach Brian. Start with your own and then branch out. At least you will know your kids will carry your values forward.